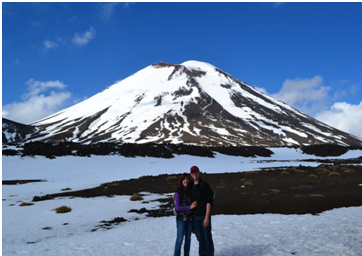 But the Tongariro National Park is definitely in a league of its own. During my time in New Zealand I did some pretty incredible things. It is a whole country of outdoor adventure and wonderful possibilities. 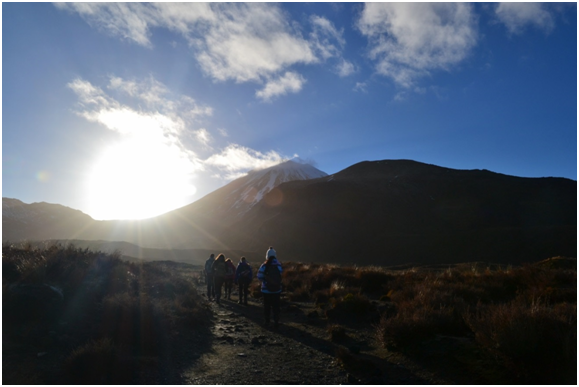 Without a doubt however, I can honestly say that the Tongariro Crossing is one of the best things I did and perhaps have ever done. Tongariro was the first ever national park in New Zealand, having being gifted to the government by the chief of a local Maori tribe. The area is sacred to the Maori people and the fact that they gifted it to the people for everyone to enjoy just proves how extraordinary the area really is. It needed to be shared and protected forever. It is even recognised as a World Heritage Site, so you can appreciate the natural beauty I am talking about. just because of the scenery, it is genuinely tiring! The first part of the walk to Soda Springs is fairly flat and easy. It is the climb following this to the South Crater that starts to reveal the challenges ahead. They don’t call it the Devil’s Staircase for nothing! A steep climb and you are rewarded at the top with stunning views. which may be better known as Mt. Doom to any Lord of The Rings fans. There is usually an option to climb to the top of Mt. Ngauruhoe, but it is a treacherous ascent and it was too dangerous on the day of our trip. There had been recent snowfall and expert equipment and guidance would have been required. At the time I was fairly disappointed not to be able to do it, but I soon realised that it would have added an extra 2 and a half hours (and more aching joints) to my journey. Once I considered this I didn’t feel so bad. The south crater leads to the red crater ridge, which was described to us as ‘THE POINT OF NO RETURN’. Once we got there we could see why. We had to navigate the ridge clambering up a rocky peak with steep drops at either side. It was almost like crawling on your hands and knees at some points, as some of the rocks were a bit unstable. Good job it wasn’t windy! It felt amazing to reach the top though and to look out for miles at snow covered summits and the valleys below. How often can you say you have climbed across the ridge of an active volcanic crater? It is slightly unnerving, but at the same time exciting, when you know you are about to enter a volcanic hazard zone willingly. 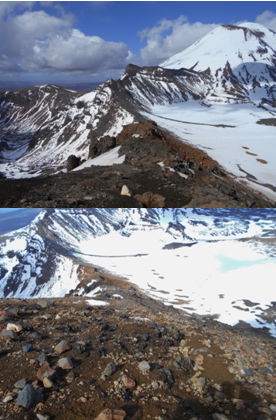 The last eruption was in 2012. 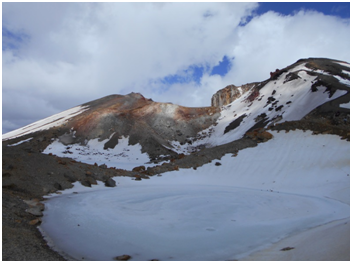 We could feel heat rising through the ground and see the thermal steam while we were sat looking at the Red Crater. The Red Crater itself was impressive, as you can see, but the next view was probably one of my favourites. Even though the Emerald Lakes were mostly frozen they were still beautiful. I would love to see them in summer with their full colour. 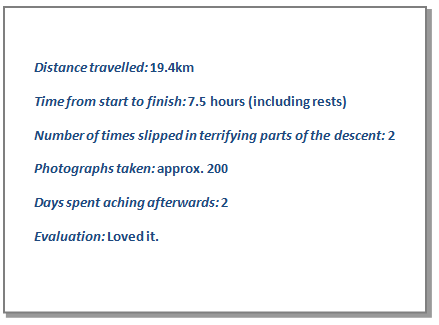 The only issue was getting down to them, because the descent from the red crater to the lakes was definitely not ‘easy’ as stated on the information sheet we were given at the beginning of the day. It was more like a rock slide. Once we got down we were inside the central crater, walking across a winter wonderland. Then we slowly made our way down to the Ketetahi Shelter and through the forest to the car park. The forest at the end was the worst part for me. It felt like it would never end and you couldn’t see through it. You get an overwhelming sense of achievement at the end of this challenge. From climbing volcanoes, to hiking through craters covered in snow, to wandering through the forest, it is a journey you will remember for a lifetime. The views are truly phenomenal. This is not an easy trek by any means, but it is definitely more than worth it.